Enchanted is a nice spin on the generic princess fairy tale story. This damsel, Giselle (Amy Adams), almost seems like a spoof of all the princesses that have come before her. The whole movie seems to be poking fun at Disney princesses, which is funny because Enchanted was made by Disney. This is one of the reasons I have a lot of respect for Disney as a corporation. They are not afraid to poke fun at themselves if it helps them serve their purpose (making money). Most corporations would never allow a movie to be made that lambasted all of the things that made them famous in the first place, but Disney is not afraid too. They see that Enchanted is a fun movie that would be successful. Despite the fact it was making fun of their history, Disney still green lit this film without hesitation (well, there may have some hesitation, what do I know). The film follows Giselle, a young girl who has just met her one true love, who also happens to be a very eligible prince, Edward (the perpetually unlucky in love James Marsden). After knowing him for a day or two, they decide to get married. This does not mesh well with Edward’s evil stepmother (Susan Sarandon) as she wants to remain Queen for a little while longer, but her reign will end as soon as Edward is married. To prevent these upcoming nuptials, the Queen uses a spell to send Giselle to a faraway land– present day New York. New York is not ready for Giselle, who has come from the animated land of Andalasia, where animals speak and true love is a musical montage away. She eventually enters the life of a cold hearted single parent (Patrick Dempsey) and helps him reconnect with his young daughter. Along the way, Prince Edward has also travelled to New York to find his bride, but the evil Queen has also followed him there to make sure Giselle never makes her way back to Andalasia. This was a fun movie. Amy Adams is great as the princess in another world. She really captures the essence of a live action Disney princess. I really admire Amy Adams as an actress. She is able to do something like Enchanted or The Muppets, but then be an Oscar nominee in American Hustle and hold her own against Christian Bale. She is one of the true all round actresses working today, equally good in comedies and drama. The rest of the cast is good. I really enjoyed James Marsden as the clueless Prince Edward. He is such a spoof of the classic Disney prince, I loved it. I also really enjoyed the soundtrack for this film. There are some catchy tunes here, especially the opening number. 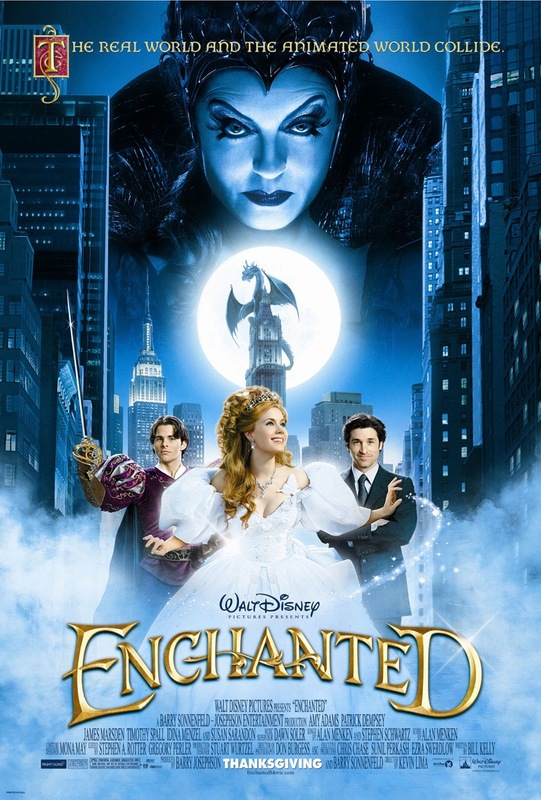 For all the praise Frozen recently received for subverting Disney princess stereotypes, I couldn’t help but wonder if everyone had completely forgotten Enchanted. This was the original “poke fun at the parent company” princess movie. Yet, it still had all the charm and whimsy that one would expect from the genre. Maybe it doesn’t count because it’s not wholly animated? The plot of Enchanted isn’t groundbreaking in the same way Frozen‘s was, but it does question many of the plot points that typical fairy tales contain. The movie starts in the animated kingdom of Andalasia, where a young girl name Giselle (Amy Adams) is saved from a troll by Prince Edward (James Marsden). The two instantly fall in love and decide to get married. This angers Edward’s evil step-mother, Queen Narissa (Susan Sarandon), who will lose the throne once Edward is married. On their wedding day, Narissa disguises herself and banishes Giselle to a world “with no happy endings”– the real New York City. There she is taken in by jaded divorce lawyer, Robert (Patrick Dempsey), at the insistence of his young daughter, and waits for Prince Edward to come and save her. That pretty much ticks all the boxes on the traditional fairy tale list, right? Where Enchanted really starts to turn the genre on it’s head is when Giselle is hanging out in the real world. The movie points out how ridiculous Disney movies actually are through the juxtaposition of a naive princess in hardened NYC. She cleans an apartment with the help of cockroaches, rats, and pigeons. The concept of dating is foreign to her. She breaks into song in the middle of Central Park, much to Robert’s chagrin. His perfectly good curtains are ruined because she decides to make a dress out of them. All of this makes perfect sense in Andalasia, but seems ridiculous in the real world. But for all her princess-ness, Giselle eventually casts aside the stereotypes without completely changing her personality. Through the course of the film she transforms into a modern woman, but retains her charming optimism. She learns the merits of getting to know someone before agreeing to marry them (a theme also explored in Frozen). She discovers that true love can exist, it’s just rarely a “love at first sight” scenario. And in the end she saves her “prince” rather than waiting around for someone else to do the heavy lifting. Enchanted is a really well made twist on the classic fairy tale film that built the Disney empire. It’s full of the same magic and beautifully written musical numbers as its predecessors, but with enough reality to bring the concept into the new century. As much as Frozen broke the mould when it comes to princess movies, it probably couldn’t have done so without Enchanted putting some cracks in it first.